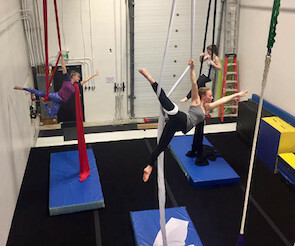 Produced by Sarah Scheunhage and Iain Duncan, The Capital City Circus was founded in 2017 when Sarah moved back to Vancouver Island to open The Rising - Victoria Centre for Circus Arts. Iain and Sarah met when they performed together years ago as part of the Underground Circus in Vancouver, and were excited to build a new show on the island. The show is based out of The Rising and incorporates local performers as well as the fantastic works of their Vancouver colleagues Matt Henry and Jonathan Scott. 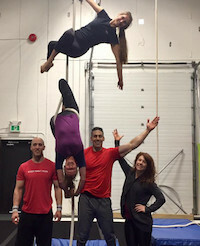 Sarah Scheunhage: aka The Silk Starlet, is a professional aerialist and acrobat specializing in aerial silk, lyra and lollipop lyra, and the founder of The Rising - Victoria Centre for Circus Arts. Sarah's background includes extensive training in circus arts, and university studies in contemporary dance, giving her an eye for detail and bringing elegance and excitement to every performance she creates. She has performed around the world on cruise ships, at corporate events, and in circus ensembles of various sizes. Iain Duncan: With over 20 years experience as a juggler, musician, and physical comedian, Iain is in his element on stages of all kinds. Iain began in his teens, studying music at university and movement theatre with renowned choreographer Anna Wyman. Iain has continued since, learning circus skills, improv, voice technique, and even stand-up comedy. Iain performs in a wide variety of stage shows, including The Anti-Gravity All-Stars, The Duncan & Scott Vaudeville Revue, and various music ensembles in which he plays saxophone. In addition to performing, Iain speaks on applying techniques from the stage to business speaking. Whether you need a dazzling intro act, an hour long gala, or a comedic duo show with audience involvement, we've got it! We've been building shows for 20 years, and we'll bring you the perfect show for any setting: festivals, corporate events, theatres, and family shows. The full length revue is a group stage show up to an hour in length, with aerial silk and hoop acrobatics, a daring balance and escape act, two person high-tech glow juggling, the classic vaudeville seven spinning bowls, and more! The show can include comedy and audience interaction, or be set entirely to music for international audiences. Polished, professional, and flexible, this show can be adapted for a wide variety of stages and venues. Custom material from your organization can even be incorporated for that extra touch. Technical: The show can use from 3 to 6 performers, and run in length from 10 minutes to an hour. It can cover a large stage, or fit in small venues and set-up quickly: perfect for industry events in hotels and convention centers. The Capital City Circus provides all rigging and technical needs, including a freestanding aerial rig for venues without rigging points, and optionally sound and stage equipment and personnel. The choreographed acts can accompanied by a live band, with the band available for additional performances before or afterwards. The Capital City "Pocket Circus"
The Pocket Circus is a portable yet punchy two person stage act that sets up fast, but plays huge. Performed by Sarah Scheunhage and Iain Duncan, the show includes aerial hoop and silk acrobatics, virtuoso solo juggling, and daring vaudeville stunts such as the Rola-Bola Straight Jacket Escape! The Pocket Circus can be performed with spoken comedy and audience interaction, or set entirely to music for international audiences. Technical: Show length from 10 to 30 minutes, two performers. Best presented with a ceiling height of 16 feet or higher. The show can be performed with venue rigging points or with a free-standing portable rig, enabling venues of all kinds. Have our team produce a show to your exact specifications. With decades of experience in festival and corporate entertainment, we work with BC's very best variety performers, magicians, musicians, and circus artists. We'll even incorporate your organization's material, including custom comedy, product placement, visual branding, and more. We'll work with you from design right to performance, and take care of all the technical logistics: lights, sound, technicians, and staging. Based out of The Rising - Victoria Centre for Circus Arts, we can provide a rehearsal and run through venue as well. Let's create your most powerful and memorable event ever! Technical: Show length can range from 5 to 60 minutes, and can be designed for stages of all sizes. Audience interaction can be utilized, or your show can be completely unspoken. Music can be performed live or pre-recorded. It's up to you!